RHINELANDER CLASS: CHRISTINE WILL GUIDE YOUR YOUNG SEWIST WITH ALL THE BASIC SKILLS TO GET THEM SEWING AND LOVING IT. 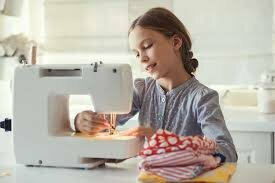 THIS CLASS WILL GIVE YOUR YOUNG SEWIST THE SKILLS AND CONFIDENCE TO ADVANCE TO OTHER PROJECTS. THE GROUP IS OPEN TO STUDENTS EIGHTS YEARS OLD AND UP. EMPHASIS IS ON HAVING FUN WHILE LEARNING THE VALUABLE SEWING SKILLS. STUDENTS WILL PURCHASE THE BOOK THAT ACCOMPANIES ALL OF THE CLASSES. THEY MUST HAVE A SEWING MACHINE IN GOOD WORKING ORDER & KNOWLEDGE OF THE MACHINE. (THREADING, WINDING BOBBINS, CHANGING STITCH LENGTH & STITCHES.) EACH CLASS WILL HAVE A PROJECT KIT PREPARED FOR EACH STUDENT WHICH IS INCLUDED IN THE COST OF THE MONTHLY CLASS FEE. Requirements: Book, machine in good working condition, student must know machine operation.